BMI Redland’s Cambrian Slate has been used on a new home near Weston-Super-Mare, which now benefits from a 15 year guarantee. Facing out across the Bristol Channel, the Beach House at Brean, near Weston-Super-Mare, is both striking and robust – and now features a roof guaranteed by BMI Redland for 15 years against the storms and aggressive marine conditions it faces. Self-builder Phil Scott chose Cambrian Slate from BMI Redland, partly because of the recommendations from BMI’s Technical Department and partly because of his own knowledge – he’s experienced in construction as his family business includes caravan sites and pubs, for which he does his own building and maintenance. “We’d done a similar job on a big pub further down the coast and used Cambrian on that and it had worked well. It didn’t clatter, it isn’t heavy, and the wind can’t rip it off. Plus, we get a 15-year guarantee if we install to BMI Redland’s recommendations,” he said. The ability to withstand the wind is crucial because of the house’s unusual design – Phil describes it as ‘four houses in one’ – as makes the most of the extensive views from its elevated coastal plot with the lounge, dining and kitchen areas all located at first-floor level. The net result of this is that there are effectively four roofs, all of them mono-pitched, at only 17.5o to reflect neighbouring ridge heights. Architectural consultant Nigel Tottle wanted a natural grey/black finish that would complement the palette of colours being used for the soffits, guttering and fascias; while Phil wanted a low, preferably non-existent, programme of maintenance. “The roofs have nice sharp edges and a cleanness of line that adds to the visual appeal and plays a large role in creating the overall effect,” said Nigel. Phil recruited a skilled team for this project through his previous property work, including TD Roofing and Dean Leadwork from Taunton in Devon – a specialist in lead who normally works on church restorations. Dean’s expertise was crucial because the cuts to the slate edges made them too long for the cloak verges used on the other sections of roof, so Nigel and BMI’s Technical Department collaborated to produce the carefully detailed roof edge for the angled balcony roof. 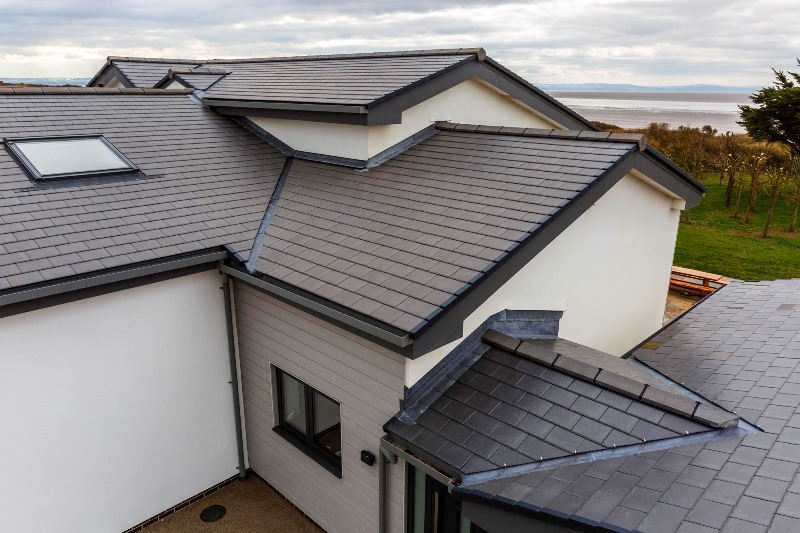 As a result, the roof has a 15-year guarantee that covers weather tightness, durability and design liability – because the tiles are installed with recommended fixings under the BMI Redland SpecMaster service. 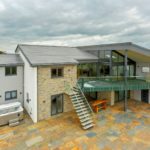 This is a free-of-charge roof specification service that covers slates, tiles, fittings, accessories, fixings, ventilation, underlay and battens – all in an NBS-based format to integrate into the building specification.